CMT is the leading manufacturer in the world for quality industrial boring bits. Our extensive product line includes dowel, through hole, twist drills, hinge boring bits and diamond tipped Drill bits for extremely abrasive materials and up to 20x drill life. The hinge drill bits are available in 3 different drilling lengths, a wide range of diameters and qualities for performance and price. 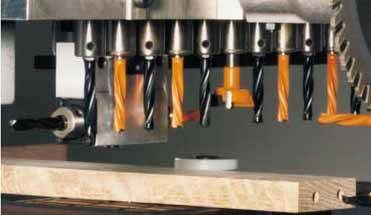 The combination of micrograin carbide, PTFE coating, high strength steel body, six axis grinding and a unique shock resistant brazing are some of the factors that make CMT the leader in industrial boring bit technology and diamond woodworking tool production.